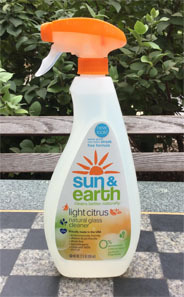 $7.80 Sun & Earth Glass Cleaner is made from 100% plant oil. It does not contain phosphates, allergens or dyes, synthetic fragrances and chemical preservatives. This natural citrus scented glass cleaner works well on glass and windows, enamel, stainless steel, chrome, plastic and most household surfaces. Biodegradable and safe for septic systems. Vegan and cruelty-free. 22 oz. Money-saving tip: don’t throw out your old t-shirts. Cut them up for cleaning rags and you won’t need paper towels to clean the windows and other surfaces.